Sussex are on course for a vital victory in their second-division promotion bid after taking a first-innings lead of 240 on an extraordinary second day of their Specsavers County Championship against Leicestershire at Hove. Leicestershire slumped to 49 for 9 in reply to Sussex’s 373 before a last-wicket stand of 84 between Mohammad Abbas and Callum Parkinson took their side to 133. Sussex had a lead of 240 but decided not to enforce the follow-on and when bad light brought an early close with 18 overs not bowled they were 100 for 6 in their second innings, an overall lead of 340. Eighteen wickets fell in the day. Leicestershire’s top order was wrecked by a superb spell from Ollie Robinson, who took four top order wickets in 18 balls to reduce the visitors to 10 for 5. Paul Horton was caught at slip off his second ball and in his second over Robinson trimmed Colin Ackerman’s off bail and then had Mark Cosgrove leg before playing deep in his crease. Ned Eckersley became his fourth victim – and 50th of the season - courtesy of another good slip catch by Chris Jordan while Jofra Archer picked up a wicket when Harry Dearden was caught behind off a brutish lifter. Robinson was celebrating his second five-for of the season when he caught Ben Raine in his follow-through and it was later announced that the 24-year-old seamer, who has taken 169 wickets in 65 appearances, had signed a new contract with the county. 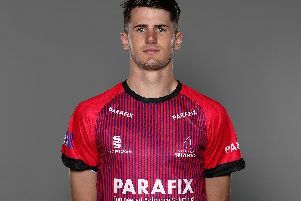 Archer picked up two wickets and Jordan one to leave Leicestershire 49 for 9, but Parkinson and Abbas counter-attacked effectively once Robinson and Archer had been withdrawn from the attack. Parkinson hit five boundaries in his season’s best 48 off 52 balls while Abbas smashed left-arm spinner Danny Briggs back over his head for a straight six as the stand blossomed. The pair batted for 18 overs before Parkinson was caught at mid-off off left-arm spinner Danny Briggs, leaving Abbas unbeaten on 32. With the light poor and floodlights on it was a surprise Sussex did not bowl again, opting instead to make sure they did not have to bat last on a deteriorating pitch. But Leicestershire had gained confidence from the efforts of Parkinson and Abbas and Sussex lost six wickets after tea. Ben Mike, who took 4 for 57 in the first innings, picked up Harry Finch (35) and Luke Wright (1) in the same over after Ben Raine and Abbas had struck once each with the new ball. Dieter Klein had Phil Salt caught behind off an expansive drive for 35 – only his second wicket of the season – and before the close David Wiese bagged a pair when he was lbw in Raine’s second spell. At the start of the day Sussex had added 53 runs for their last two first-innings wickets before being dismissed for 373. Jordan made 64, the fourth half-century of the innings. Robinson said: "It's been a great day for the team and for me personally and we're pleased with the position we've put ourselves in, although the job's not done yet. To be honest, when we went out to bowl I expected the pitch to be a fit flatter than it was. But we tried to be patient, hold our lines and when the nicks came we held our catches. "As a team, with input from Dizzy (Jason Gillespie) we decided not to enforce the follow-on. We think the pitch is getting worse and we feel it is going to be easier to score runs on days two and three than chasing, say, 150 on the last day. And it also means us bowlers can get a good night's kip tonight and come back fresh tomorrow."